Want to find “the one” but don’t want to leave the house? Honor your introversion instead of trying to fight it. If so, you might be an introvert. The difference between introverts and extroverts is that the extroverts are energized by socializing—the more the merrier!—while introverts find it draining. We don’t crave lots of socializing, we don’t love meeting new people and, all things considered, we’d rather stay home. No, to find love, you’re going to have to leave the house and open yourself up to new people. But take heart: It’s not as hard as it sounds if you honor your introversion instead of trying to fight it. Here are some tips to get you on the road to happily ever after. 1. Remember what you bring to the table. Does it feel like you can’t possibly get noticed amidst the razzle-dazzle of extroverts? Remember this: Extroverts may sparkle, but introverts glow, and that’s equally attractive. Among introverts’ wonderful qualities: We are great listeners; we carry an aura of calm and quiet; we think before we speak; we don’t compete for the spotlight. All these are wonderful attributes and the right person will notice you for them. 2. Know what you’re looking for. Birds of a feather or opposites attract? Should you look for a fellow introvert, or are you better off with an extrovert? Either combo can work, depending on what you want and need. Some introverts would rather be with someone who stays happily at home on weekends, while others prefer a partner who will play social director for them both. A little forethought can help you decide if you should look for the person who dances into the party, or who sits quietly on the sidelines, observing the action. 3. Just say yes. You won’t find love in your living room—you have to leave the house! Any time you get an invitation that doesn’t sound like absolute torture, say “yes.” Say “yes” to happy hour. Say “yes” to dinner parties. Say “yes” to fix-ups. Just promise yourself that when you’ve had quite enough of whatever you’ve said yes to, you are allowed to go home. This is the cardinal rule. It’s much easier to say “yes” in the first place if you know you can leave when you’re ready. 4. Consider online dating. OK, maybe you can find love in your living room. 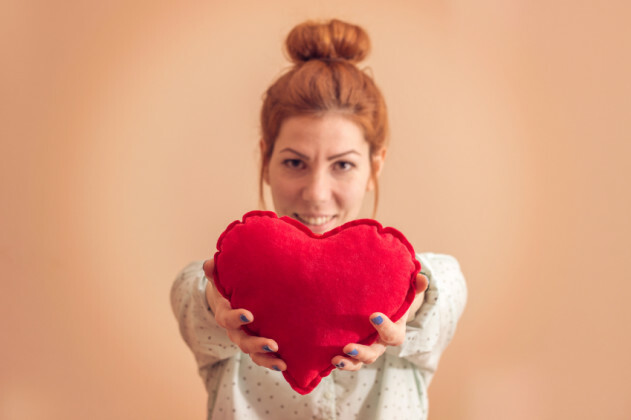 Online dating can be ideal for introverts, since we tend to express ourselves well in writing, we can take our time to think before we speak, and getting to know a person online first takes some of the stress out of first date small talk. One caveat for introverts: If you’ve found someone interesting, don’t let the emailing drag on too long. You know how you are. You don’t want to get all intimate via email and then find there’s zero chemistry when you’re finally face-to-face. 5. Join up. Introverts aren’t usually big joiners, but group activities have benefits. For one thing, they put you in proximity with people in situations where chitchat (introvert kryptonite) is not the main focus. And introverts tend to warm to people slowly, so a group that gets together on a regular basis—a class, a wine club, a book group—allows you to get to know people at your own pace. And finally, even if you don’t meet someone datable, you’re at least doing something that interests you. 6. Disengage your introvert “leave me alone” force field. Being able to send the nonverbal message that we don’t want to be bothered is an important skill for introverts. However, you also want to be able to turn that off in situations where you are open to being chatted up. Uncross your arms and legs, put the phone or book down, and look around. And take a tip from radio announcers, who know that putting a smile on their lips puts a smile in their voice. Thinking I’m approachable will help you put out an approachable vibe. 7. Remember that dating is easier than meeting people. Research finds that extroverts are best at rocking job interviews, but introverts tend to be better at getting the work done when they’re hired. Same goes for dating: Introverts might find meeting people difficult, but once we’ve met someone worth a test run, we move into more comfortable territory. Introverts prefer one-on-one interactions to group events. We’re thoughtful conversationalists, great listeners, and we aren’t constantly looking over our date’s shoulder to see what everyone else is up to. These qualities make us great dates. So get out there and let your glow show. Sophia Dembling is author of Introverts in Love: The Quiet Way to Happily Ever After and The Introvert’s Way: Living a Quiet Life in a Noisy World.